During the 1990s, several African countries, namely Angola, Cote d’Ivoire, the Democratic Republic of the Congo, Sierra Leone, and Liberia were plunged into chaos and embroiled in devastating civil wars. Thanks to economic and political insecurity and contentious inter-ethnic relations, rebel groups such as the Patriotic National Front of Liberia under the leadership of Guy Taylor hijacked diamond production in order to finance their insurrections. 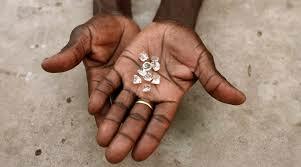 Often referred to as “blood diamonds” or “conflict diamonds,” these and other valuable minerals helped incite instability and maintain repressive regimes that resulted in the deaths of hundreds of thousands of innocent people. On December 1, 2000, the United Nations General Assembly passed a draft resolution which became the framework for a global certification system, later known as the Kimberley Process, designed to help stem the movement and sale of conflict diamonds by means of commercial diplomacy and cooperation. 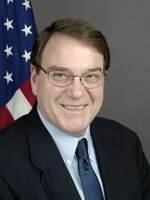 Serving a special tour of duty as the U. S. Representative to the Kimberley Process, Alan Eastham discussed his role in helping reduce conflict diamond trade worldwide in conjunction with other governments, the diamond industry, and civil society in an interview with Charles Stuart Kennedy in July 2010. 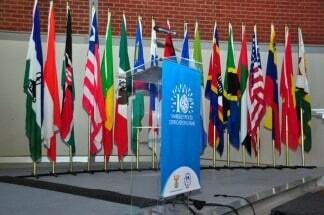 Please follow the links to read more about Africa, international cooperation and world trade. I did and I went and talked to one fellow who was a staff officer working on conflict diamonds and I talked to the policy person who would be guiding me on this, Anna Borg, who was a Deputy Assistant Secretary in the EB bureau at the time, and I thought well, that sounds pretty interesting. It was to serve as the U.S. representative to something called the Kimberley Process, which was a tripartite set up, with the three parties being governments, NGOs, and the diamond industry, to attempt to do something about the problem of diamonds fueling conflict. The Kimberley Process had been launched by the State Department Africa Bureau a year or two before. The EB bureau took it over because it dealt with trade regulation first and foremost. It had gained considerable momentum during the period between say January and August of 2001. We were about to embark on a series of international meetings intended to produce a regulatory text that provided an agreement for a system of regulating the trade of rough diamonds and to ensure that proceeds of rough diamond sales did not go to warlords and others who were interested in fueling conflicts. So I took the job. The problem was that in Sierra Leone and Liberia, rebels had taken territory where rough diamonds were found and were selling those diamonds to earn funds that they used to fuel rebellion. Well, there was no regulatory system for rough diamonds. Rough diamonds were traded without regard to any sort of regulation except the normal maintenance of customs records for revenue purposes and it was quite a fascinating negotiating process. The idea had been triggered and intellectually sustained by a group of non-governmental organizations, most particularly an outfit called Global Witness from London, but also an NGO called Partnership Africa Canada, which was based in Ottawa, I believe. Those guys provided the advocacy piece and the passion for solving the problem of diamond resource revenues contributing to wars and their associated atrocities in Africa; in fact, they had a larger objective. So you had the NGOs and then you had industry. The diamond industry was a fascinating piece of work. You had the mining sector divided into two pieces; there was the hard-rock mining industrial mining sector, more or less personified by a couple of huge companies that do hard rock diamond mines….using explosives and drills and big trucks and grinders and quite high tech equipment in some cases. They said, “Look, we are not the problem. We produce our diamonds in our mines, we have control over the stream of diamonds as they move out of our mines into world commerce. Why are you bothering us?” This had been the earlier attitude of big companies like DeBeers. There’s a big Russian mining company, some mining in Canada, and there are a couple of Australian mining companies that produce diamonds in this way. The problem was in the other sector, which is the so called artisanal mining sector, which you find in Sierra Leone, Liberia, in the Democratic Republic of the Congo. I just mentioned three trouble spots you might notice. 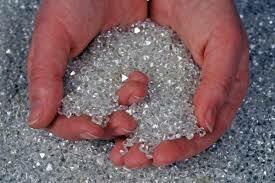 The geological process is that all diamonds were produced about a billion years ago in the center of the earth. They are extruded to the surface of the planet in geological formations called kimberlite pipes. Kimberlite is a rock term, a geological term, for a particular kind of rock that has extruded up from the center of the earth and that basically comes to the surface. Artisanal diamonds are found in areas where kimberlite pipes have eroded over millions of years and the diamonds have washed down an alluvial stream bed on the surface of the earth and, therefore, are available for mining close to the surface using techniques involving nothing more complicated than a bucket and water. It is those artisanal mines that were, and to some extent, still are, the problems in terms of generating diamond revenues for rebels. In fact, De Beers took some steps to restructure their flow of diamonds to the world market; they stopped buying Sierra Leone diamonds. I met a lot of De Beers executives during the ten or eleven months that I did the diamond negotiations and every single one of them cut his teeth on buying diamonds in Sierra Leone, sitting behind a counter and buying diamonds brought in by little guys who brought them in in a poke, wrapped in a piece of paper; that’s where all De Beers executives started, buying diamonds from Sierra Leone and Angola. 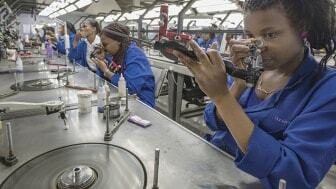 But they had restructured, they had stopped buying those diamonds; De Beers relied only on its own mines. They said, “We know where our diamonds come from; you’ve got to go talk to somebody else. This is not our problem.” But De Beers had come to realize that a diamond has no intrinsic value, a diamond has no intrinsic value. The Under Secretary for economics and business, Al Larsen, and I used to have a lot of fun talking to him about this because he had risen, of course, to the top of the service, but one of his first tours had been as an economic officer in Freetown, Sierra Leone. So he knew quite a bit about the artisanal diamond business and diamond trade from his early career service in Sierra Leone. 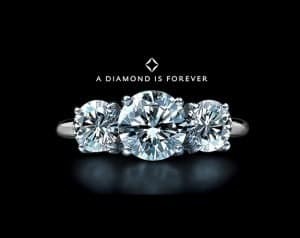 Of course, there is the long history of the brilliant and most successful advertising campaign of the 20th century by De Beers in the United States, that “diamonds are forever” advertising campaign. The term I heard a lot when I was doing this job was that diamonds are an aspirational product. Seriously, it means you want to be the kind of guy who buys your girlfriend a diamond. The marketing strategy that De Beers was undertaking during this period from 2001-2002 was in association with LVMH, which is the marketing arm for Louis Vuitton luggage, Moet and Hennessy; Moet champagne and Hennessy Cognac. They were marketing diamonds entirely as a luxury thing, entirely as aspirational product. The idea was to milk as much value added out of this product as you could possibly do; a product, which has only a value calculated in emotion rather than its intrinsic use for the maintenance and sustaining human life. So that was the marketing strategy that De Beers had. 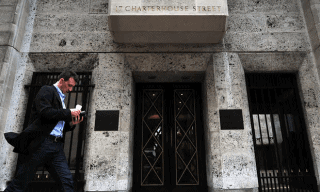 Now the first meeting that I went to associated with this diamond thing was held in the De Beers headquarters on Charterhouse Street in London, which is where the vault is that contains De Beers’ three-and-a-half or four billion dollars in diamonds. It’s the Grand Central Station of the diamond industry. Now De Beers has changed a bit over the ensuing years, but De Beers had a system whereby they marketed their diamonds, sold their diamonds from the De Beers Company to manufacturers through a system called sight…. Their clients were called sightholders and the word means that every five or six weeks the sightholder gets to look at some diamonds. They go into the De Beers headquarters and they meet with their De Beers salesperson who is the person who has a long-term relationship with the client. They are taken into a room and there are diamonds displayed on the table; they call it, quite quaintly, ‘the box’. They get a sight of the box. In the old days DeBeers would ask one question: Do you want it? And after they had gotten a look at the box the answer was yes or no, you buy the whole box or you buy none of it. It was the only way that De Beers was able to maintain the market in diamonds was by the mix of diamonds they put in the boxes for their 150 or so sight holders. If the price of some particular kind of diamond was too high or too low, DeBeers would adjust the quantity offered to the sightholders in the box. More, the price would go down as the diamonds entered the market; fewer, the price would go up. Since they had something in the order of eighty percent of the world diamond market passing through the London headquarters, they were very much able to control and maintain the price of diamonds. ….The market is segmented; I started off with the mining segment of it and then after the mining segment there is a kind of middle segment of diamond traders who are centered in a lot of different places around the world. 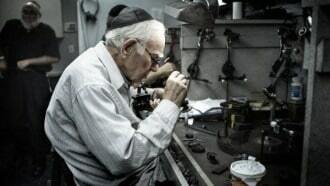 They used to be almost one hundred percent in Antwerp or New York; now Tel Aviv is a big sorting center, Dubai is becoming bigger and bigger, and there are several other places around the world that are trying to get into the diamond sorting business. But here is the problem. At Christmas, Zale’s or some large diamond retailer – Wal-Mart, for example — Wal-Mart is the biggest diamond marketer in the United States of America by volume, by dollars. If those guys want to sell 50 thousand, let’s say, one carat of a certain grade, brilliant cut engagement ring, they’ve got to come up with the raw material for that. So you have an ultimate customer who is in retail, then you back up from that and you have the manufacturers, you back up from that you have this segment of traders of exchange houses who are responsible for assembling the raw material for the manufacturers to be able to satisfy the requirements of their customers. There is no place in the world where you can just buy ten thousand pieces of raw stock that can be cut into one carat, brilliant cut engagement rings. You have to go to Antwerp or Tel Aviv or Dubai and ask a trader to get it for you. There are these rooms wherein there are big lighted tables and lots of diamonds that are sorted and are traded in a way that enables the manufacturers to acquire the raw stock that they need to do the cutting. Now a manufacturer may on speculation do the cutting and then sell it back to a trader who then sells it to Zale’s or Wal-Mart or some other intermediator based on having already been manufactured and graded. It is real complicated and the horrible part of it, from a regulatory point of view, is that you are dealing with literally millions of small pieces of diamonds that are mixed in every conceivable way by this intermediate trade. There is no way to keep up with where the given diamond came from once it goes into one of those little packets that has 600 one-quarter carat, brilliant cut diamonds in it; you can not tell where a diamond came from once it gets into that trading system. So that was the challenge that we were dealing with. If you meant to regulate the diamond trade, you needed to regulate from the source to the customers, but the reality you encountered was that middle segment of the trade where diamonds are moving around in a way where no one cares about the origin of it; they care about the size and quality. They don’t care about where it came from, nor are they able to tell. So what we decided to do was to clean up the whole flow. The only way we could figure out how to do this was to associate the major producing and consuming countries with a system in which whenever rough diamonds moved across international boundaries they were accounted for, accounted for in the sense of declarations made of a legitimate origin rather than coming from an artisanal source associated with a rebel group that was fueling conflict. So over the period from when I started in September 2001 up until March of 2002, we held a fairly intense series of negotiating meetings in which we tried to come up with a system that would meet the regulatory requirement that had been perceived, which was to insure that only clean diamonds made it into the intermediate step of the trade. It also did not place an inordinate burden on the trade. The problem with that middle section of the trade is that you have high volumes of diamonds moving around and very low margins. If you have someone who is selling a packet of rough diamonds from his stock to another one’s stock he is probably making two percent on the transaction. If you add a record keeping requirement into that intermediate part of the trade, if you could do that with a treaty, which I doubt, that required all diamonds wherever to be accounted for with respect to origins you would probably destroy some financially weak companies by adding to their interior costs in a way that destroys their margin. So we were very conscious of that and the industry never let us forget it. There were a lot of other subsidiary issues involved. The NGOs wanted us to deal with problems of diamonds being used as a vehicle of corruption, diamonds used as payments off the books for illegal services. The industry didn’t want to do that and they did not think that they could figure out a way to do that with respect to their particular way of doing business. Now as we speak this year in 2010 there is an effort to broaden the scope of Kimberley regulatory system to capture diamonds that were produced in mines wherein there may not be conflict but there may be human rights violations. 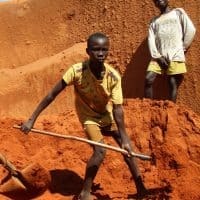 A specific case that has come to the table within the last few months is the case of the Marange Mines in Zimbabwe, where there is forced labor and a lot of different things going on. But we were trying to deal with diamonds and conflict, not all the ills of the world. After I took the job and started working on this particular project, I would describe it to my friends outside of government when they asked what I was doing these days; I’d say I was working on conflict diamonds. They would make a particular gesture involving using one hand to chop off the other. There was quite a lot of very graphic imagery, particularly about Sierra Leone in the late ‘90s, relating to the use of child soldiers, the brutality of cutting out people’s tongues and cutting off their limbs and leaving them to be a burden to their families and unable to live a productive life. 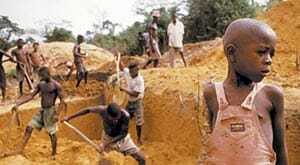 The perception was that this cruelty was fueled by the illicit trade of diamonds in Sierra Leone. That was the problem we were trying to deal with, the maiming and brutality that was taking place in Sierra Leone and in a couple of other places. We could clearly see that the proceeds of rough diamonds were contributing to this. 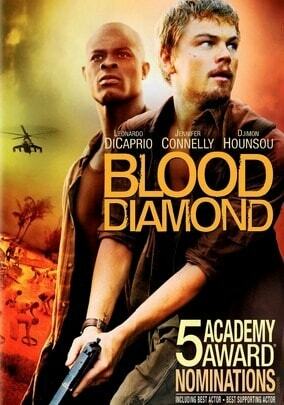 ….Blood diamonds were a threat to the viability of the entire industry. 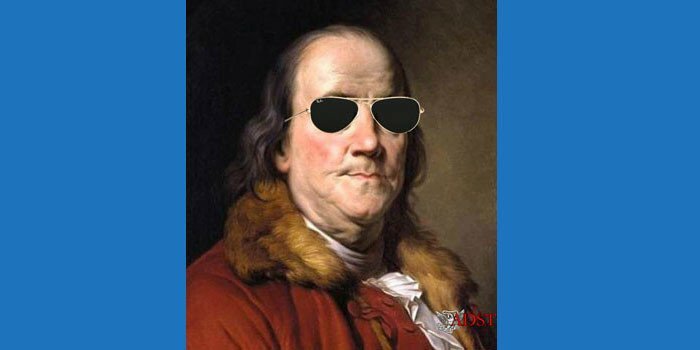 They could not see a way to deal with diamonds as a means of transfer of value, transfer of funds, and transfer of money in a global sense. They could not see how you would deal with that and I never thought it was a very big problem anyway. You read about lots of fiction, lots of spy fiction and thrillers about the precious diamonds, the black diamonds and blah, blah, blah and all this stuff about people being paid off in diamonds and that sort of thing. You know what, if I were going to use diamonds as a means of compensating someone for an illicit transaction I believe in my mind that I would have to be prepared to lose at least 25 percent of value in the transaction. You’ve got to know what you are doing to buy and sell diamonds, you have to know what you are doing, you have to be in the trade. For Joe Smuck off the street to be paid in diamonds for planning a terrorist operation is just nuts. Nobody would do it because the transaction cost is so high. In the first place you have to smuggle diamonds across the international border, which is easy enough, you might get away with it, but then you have to find somebody to sell the damned things to. You are trying to sell it and there are very few diamond dealers in Antwerp, for example, that you could just walk in the door, knock on the door, get through their security and talk to somebody and say, “Look, I have these diamonds, would you buy them?” They are not going to do it. If there are dealers who would countenance this, they are very, very few and you would have a hard time finding someone who would regard that as a serious proposition not either a) something illegal that you could get into bad trouble for or b) a police sting to see if you were crooked. I just never thought that was practical. Now criminality at the high level, whether it’s in Russia or whether it is someplace else is a different matter. The taking the skim off the top, getting a percentage of the auction value, manipulating a diamond auction and this sort of thing; sure, that happens. But the notion of attempting to deal with illicit financial transactions intermediated by diamonds presents even greater challenges than corrupt transactions facilitated by cash. The industry did not believe it was a problem and did not want governments intruding into their businesses any more than governments, say tax authorities, already do. In the diamond industry, by the way, De Beers came along on this project because they eventually came to realize that if you thought that the campaign against wearing fur was bad, wait until a militant NGO starts running a campaign against blood diamonds. You saw the movie, which came along quite a bit after we had already partially solved the problem, but the industry was desperately afraid that they would get caught in an advocacy situation where every diamond was perceived as a blood diamond and their industry would collapse. Botswana is the shining example of what diamonds can do in a positive sense. The government of Botswana is actually a ten percent equity holder in the overall De Beers corporation and they have a huge big mine in Botswana operated by a company called Debswana, a combination of De Beers and Botswana, which has probably the most modern diamond mine in the world; They have an automatic sorting system. It’s interesting, they drop tons and tons of rock into one end of the plant and diamonds come out the other end and at no point after it is dropped is that rock touched by human being. I envisaged it as a little box of diamonds at the other end; I had an opportunity to go to the plant once but decided it was more important for me to stay back and write a reporting cable on the meeting I had just ended in Gaborone. Apparently, the diamonds fluoresce when exposed to certain wavelengths of ultraviolet light and so if you crunch the rock up small enough you can automate the sorting of diamonds by involving this particular light, a sensor and a burst of compressed air that kicks the diamonds off to a chute on the side. ….We were to some extent engaged in a closing-the-barn-door exercise because, if I recall correctly, that by the time we had gotten into serious negotiations on the Kimberley Process the actual practical cause of concern was being dealt with by the peacekeeping forces under British leadership in Sierra Leone. What we were doing was attempting to keep it from happening again. Charles Taylor is the name that comes up most often in association with it and there is not much difference between, in terms of diamond production, Liberia and Sierra Leone and Guinea; those three have about the same problems in porous borders and they were susceptible to violent conflict; but that was the nexus of the problem. There was not much expectation. Then you had the DRC which was a different problem. The Democratic Republic of Congo has a lot of artisanal mining but it does not manifest itself in financing rebel movements and groups except in a small way. 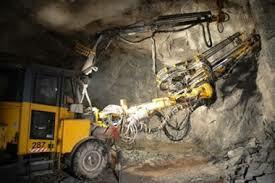 Now they have other mineral resources that are, in fact, used to advance political groups that are inimical to the operation of defective governments of the central authorities of the DRC; but that is not necessarily a diamond problem, that’s a problem of gold and other minerals used in electronics and that sort of thing. So we were to some extent engaged in an effort to regulate a problem that had been solved by other means, at least temporarily. I’ll tell you that was one of the best jobs I ever had. I really, really enjoyed it. I never had done a multilateral negotiation before, a multi party negotiation and we had multilaterals with countries, we had the industry in the room, we had the UN in the room, we had permutations of the relationships. So I went and signed the understanding in Ottawa, a bit of a ceremonial thing, and I brought it back to Washington and it turned out that what was going to ensue next was a great, enormous food fight in Washington with all the agencies trying to avoid taking on the task of regulating the diamond trade. They didn’t want to do it and that was the proximate cause for my looking for my next job.